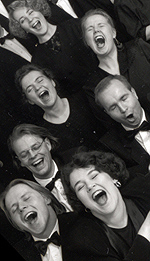 The Tapiola Chamber Choir was founded in 1984 by former singers of the world-famous Tapiola Choir and consists of 35 members. It frequently appears with leading Finnish professional orchestras such as the Finnish Radio Symphony Orchestra, the Helsinki Philharmonic Orchestra and the Avanti! Chamber Orchestra, among others, and conductors like Esa-Pekka Salonen, Sakari Oramo and Jukka-Pekka Saraste. The Choir also regularly gives a cappella concerts. The Choir has performed major Baroque and Classical works with distinguished foreign guest conductors such as Peter Schreier, Harry Christophers, Roy Goodman and Paul Hillier, and has also actively collaborated with contemporary composers. Hannu Norjanen has been Artistic Director of the Choir since autumn 1998.